Ok, so I’m honestly having one of those days today when I just don’t feel like writing. Pen to paper? Just don’t wanna. Typing words on my laptop? Not an inkling of desire over here. It’s raining and I’m tired and I have a million things to do and I’d rather be reading a deliciously irrelevant beach-read summer book…so I sat down this morning, and I wrote about that. I picked up a pen and wrote longhand about all of the frustrating and irritating things that I could think of. As soon as 3 pages were full, I put it all away and moved on to my other morning stuff. I feel a bit better now 😉 I’m still a little grumpy, my ToDo list is still heavy on me, and it’s still raining outside, BUT my words are coming out freely, and look at this! I’m writing today’s blog post. You may recognize what I just described doing as Morning Pages: a popular practice that lots of internet supers and artistic self-help gurus credit for better mental health and better writing skills and habits. It’s really an example of a simple and important part of every good writer’s creativity toolkit: Free-writing. And it’s what I’m going to talk to you about today. Free-writing can be used for a whole lot of different things within your writing practice. 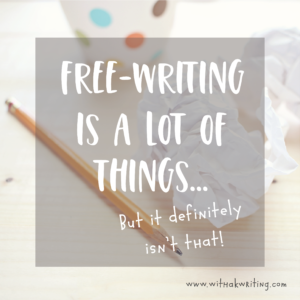 Why Bother with Free-Writing though? I already have tons of things I have to write…why do I need to add another thing to my ToDo list? In short: Free-writing will set your writing free, make your writing more flexible and strengthen your skills at the same time. I use it as a Prewriting practice sometimes, to find ideas to explore further or to try out different phrases and thoughts and see if they translate well in words. It’s like a linear stream of consciousness form of brainstorming – rather than a bulleted list, diagram or web. Free-writing can also be used as a warm-up activity before you hit Drafting. 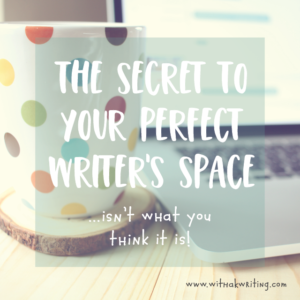 If you feel stuck (like I did this morning), you can open up on low-stakes pages that hold no expectation of excellence or perfection and work out your writing kinks before you write something that actually demands coherence – where the stakes are a bit higher. I let out all of my writing cramps this morning, in a journal that only will be read by me, before writing a post for you all to read. You didn’t have to suffer through the grumbly, disjointed crap I had to get out first. Free-writing also changes you internally. 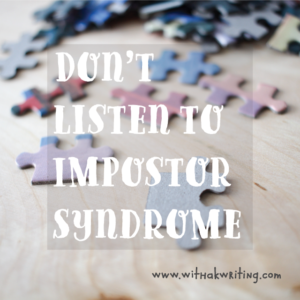 It takes the pressure off of writing for those of us who perfection-punch ourselves out of our writing groove. Free-writing also works out your sentence making muscles and helps you practice writing in your natural voice, fluidly, while honing ideas that you may expand on later. Ok – If it’s so Great, How do I do it? ~ This exercise basically includes writing freehand in a paper notebook or journal – 3 full pages every morning – before you do anything else about whatever thoughts come to mind at the time. It’s been lauded as a great way to get out the cobwebs and move through the rest of your day with a fresh mind and a creative spirit. 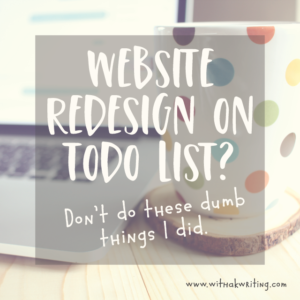 It helps me to take my writing less seriously and stress less while I tackle big jobs and small ones alike. ~ You can find writing prompts everywhere: online, in notebooks and journals, your own brainstorm list of ideas. You could make prompts for yourself in the moment as well: write about whatever comes to mind when you picture a colour, read a random word from the dictionary, are asked a vague question, see a picture of a location or a person’s face. The key here is to allow yourself to explore an idea without structure or judgement, and let yourself write about ANY topic at all. You aren’t looking for your next pulitzer prize winner here, just some words on the page. Let it be not the end of the world if it isn’t perfect. ~ I used to do this with my writing students in class all of the time. It’s fun in a group, but works well on your own too. What it entails is this: sit with a timer set to one minute intervals. Start writing on any subject, but as soon as the timer goes you have to change the subject completely: start a new paragraph and just start talking about any other thing that comes to mind…even the colour of the paint in your room, or the mosquito buzzing by your ear. This forces you to let go and move on from ideas – knowing that there will always be new ones. It also improves your ability to expand on any thought at all, no matter how hollow or silly it seems. Try activating a different part of your brain right before you start Free-writing, or while you’re at it. When you get the spatial-visual, kinaesthetic, or oral-communication parts of your brain working, your written-communication brain will be more open to creativity too. ~ I often get my students to use voice dictation software on their laptops, phones or iPods to make writing feel more like the natural oral communication we all take part in daily…I mean talking. A good one we often used is called Dragon Naturally Speaking or the Dragon Dictation app for iPods and iPads. You can set it up on your phone and go for a walk around your house, dictating your thoughts as though you are Free-writing out loud. If you’re a really active person and physical activity makes your brain hum, do some stretches while you dictate, or jumping jacks in between sentences. You can even take your phone for a walk down the street if nature gets you going…just pretend you’re talking to someone on the phone and the neighbours won’t stare too much. Follow up with some quiet rewriting of your dictated thoughts though to get the most out of the exercise. You don’t likely need to practise talking; the idea here is to link the more natural speaking and movement parts of your brain with the more difficult writing parts. If you are a visual person or an artist of any type, this will wake up your inner writer, big-time! An exercise I love doing with my clients and students is called Draw-Label-Caption. Basically, you sketch out an image first. Then, you label all of the important visual cues in the image. Finally, you write a sentence or paragraph as a caption, describing what’s going on in the picture or diagram. This activity acts as a 3 part bridge between drawing and writing, and will (without getting too deep into brain science) help you to encourage your brain to work in its happy place while you are doing something that is innately more difficult for you…like piggybacking writing skills on your happy drawing strength. ~ Use different coloured pens during Free-writing, and allow yourself to draw doodles in the margins. Just don’t let the doodles override the words altogether. I often will write different paragraphs in different coloured ink, with arrows and dashes all over the place, because my mind is very visual. It feels better, and it also encourages my mind to be more active and creative while I write. Phewf! That was a whole lot of info; I know. What I really want you to take away from this is that you should start a routine practice of writing without reason, judgement or purpose. Let your guard down and let your perfectionist persona take a vacation, while you practise setting your Voice free – however it wants to go. 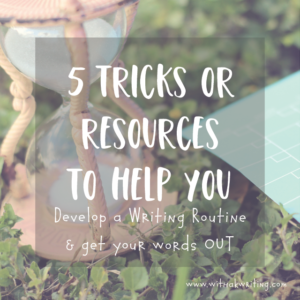 I promise you this will be a GAME CHANGER in your writing practice. Promise! Seriously! Just do it. 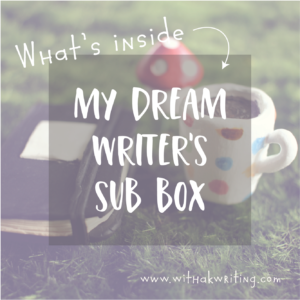 Comment below with your favourite (or the silliest) writing prompts you can find – or tell me about a journalling or Free-writing technique you love. Share, Pin, Like or Tweet if you think someone you know might like to relax their writing stress. And of course – sign up for the #30DaysWithaK free-writing challenge now, to practice free-writing and find your Voice in 30 days. I fell in love with free writing at a Girl Scout camp one summer. It was one random activity, but it made a huge impact on me. We were taken to Myrtle Grove, one of the most gorgeous places at camp, given a pen and paper and told to write whatever we thought of and not to let the pen stop moving. I never wanted to leave! The tragic end to my story is the paper I’d written my treasured first free write on was ruined by sunscreen spilling in my backpack on the way home. 🙁 I’ve always wondered what I wrote. Ah! I love that, Sarah. Use that idea as a plot bunny for another free-write: the story that disappeared. Also – GIRL GUIDE CAMP! The best, right? I am looking to set up a new blog – I have been using Blogger but don’t like the format what do you recommend – I love the light airy feeling of your site. I LOVE THIS COMMENT! Thanks so much Annette for diving right in and using this method. It’s great, right? I use WordPress (.org for self-hosted sites) as my platform. I purchased a theme from a developer to design the site around, but there are free ones on WordPress to use as well. It takes a little practise to learn the ins and outs of the ways of wordpress, but you can find lots of information about it online to help. Let me know how it goes, Annette! I can’t wait to read your blog. Ooh I love the “Draw fist” suggestion! Especially since there were a few occasions when my doodles actually sparked a topic I wrote about later on my blog. But I don’t practice it per se. This is it, Nela! If your brain is most creative in the visual, you gotta use it, right? I like using the visuals on the cards to spark creativity too. FUN! Just what I needed today – I have no ‘free writing’ techniques to share. My writing goes in intense spurts and sometimes I will go weeks without writing anything and become despondent and cranky at my lack of drive. When i am in writing mode and I commit with an end goal in mind I stay on task and won’t stray. I am going to try these techniques to see if it helps me become more consistent. Ooooh! I love it! Let me know how it goes. I find having that morning routine in place is HUGE for me. Otherwise, I would let it slip by without touching the ole Free-writing notebook. I’m excited to hear how it goes for you, Annette!